I love staying in hotels! It is so fun to have someone else clean up after you. Hotels mean meals out and no dishes! Unfortunately, hotels can also mean loud neighbors or alarms that go off in empty rooms before the crack of dawn! 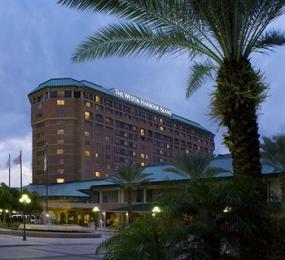 Recently, Ryan and I stayed at the Westin in Tampa Florida. It is a nice hotel. It was clean and I thought it was well staffed until I had a little run-in with a girl at the front desk. Our room was on the tenth floor and we had a slider that opened to a small ledge with an iron railing. The view was gorgeous! Ry opened the slider to let in the warm ocean air only to lean on it and get the scare of his life! The railing was loose and when Ryan leaned on it it gave way so he felt like he was falling to his death! That is not a fun feeling! When we went down to the front desk, I told the girl there that our railing on our balcony was loose. She told me the hotel didn't have balconies. True. So I rephrased my statement. The railing on the ledge outside of our room was loose. She told me the windows in the hotel don't open. Ok. We don't have a window in our room. We have a slider in our room and the railing outside is loose. She told me they didn't have sliders in the hotel. The conversation went on with her basically telling me that I was either high or insane because there was no way that I could have opened a slider to the outside! I looked at Ry and asked him if I was stupid! Wasn't there a slider in our room that had a sign on it that said to open the drapes completely before opening the slider? Did this girl not really work here? What was going on? Ryan finally said this was pointless and told me to just walk away. I was flabbergasted! I only wanted to stop an accident from happening! This is not the way to treat guests! Since she wouldn't listen to me, I put sticky notes on the slider to warn the next guests. When we got home I filled in a survey and posted a review about the hotel. I should probably call and I wish I had the girl's name that was at the desk, but I was so shocked I forgot to look! I guess my advice to you would be to be very very careful when staying in a hotel whichever one it may be, because even the nicest hotels have problems!!! Update: I did get an email from the hotel and then a follow up call from a manager. Apparently they had to up their training as the associate honestly wasn't aware that two floors of the hotel had balconies! They also assured me that the balcony railing would be fixed! I'm glad about that! I would hate to think that I could have prevented something and didn't!! Thank you Westin for following up with me and taking care of things!